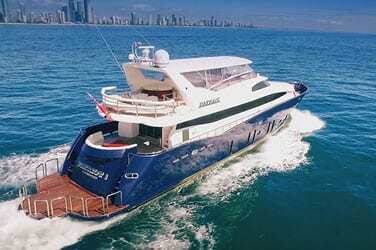 The Gold Coast Broadwater offers abundant cruising options. 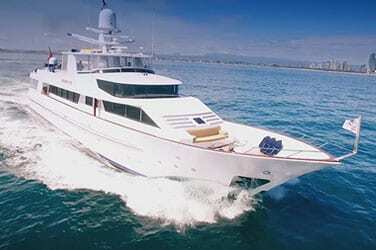 It's sheltered waters make it the ideal charter destination year-round. From the bustling city and iconic Surfers Paradise to kangaroos hopping along the golden sands of South Stradbroke Island, the Gold Coast Broadwater can entertain at every level. The Gold Coast is well know for iconic Surfers Paradise and it's golden sandy shores, so why not take to the water and experience all that's on offer in the Gold Coast Broadwater. The sheltered waters lend themselves to perfect cruising conditions year round. 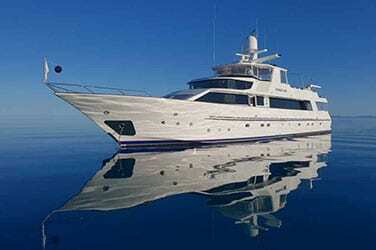 Choose from our popular charter packages or let us assist to create a charter tailored to your requirements. From corporate events to impress, family celebrations, or a leisure holiday taking in the sites and all the Gold Coast has to offer, we will provide you with a 5-Star experience to remember. Our yachts are berthed at Marina Mirage in Main Beach. Patriot 1 is available in the Gold Coast year round, while Phoenix One is available through the Summer months of December - March before heading North. We can also arrange pick up and drop off from Sanctuary Cove Marina on the Coomera River. Flights: The Gold Coast Broadwater is within easy distance from Coolangatta (Gold Coast) and Brisbane International Airports. Marinas: We can arrange pick-up and drop-off from Marina Mirage or Sanctuary Cove in the Gold Coast Broadwater. Transfers: Taxi and transfer services are available direct from the airports or your Gold Coast accommodation to Marina Mirage where the Waterline Charters yachts are based. We are happy to assist with booking private transfers.